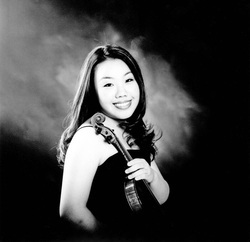 Sharon Park (3rd prize winner of the 1st Stradivarius International Violin Competition) began studying the violin at the young age of 4 and won her first competition at 5 years old. Recently, she was invited to participate in the 2006 Yehudi Menuhin International Violin Competition in Bulogne-sur-Mer, France. She performed the Shostakovich Quartet No.14 in F# Major as part of the Shostakovich Quartets cycle in Jordan Hall, Boston MA. She placed first in the prestigious Los Angeles Philharmonic Bronislaw Kaper Awards Competition, placed third in the triennial Johansen International String Competition, was the grand prize winner of the International Young Artist Peninsula Music Festival Competition, received Honorable Mention in the Pasadena Instrumental Competition and the Edith Knox Performance Competition. Sharon was named Emerging Young Artist Award Recipient 2004 $20,000 Award in Music and earlier that year, won a level II ARTS award in music in the National Foundation of Advancement in the Arts. She has soloed with orchestras such as the American Youth Symphony, Young Musician’s Foundation Debut Orchestra, Herbert Zipper Orchestra, Torrance Symphony, Indian-Wells Desert Symphony, and the Doctor’s Symphony. Sharon has also been a guest soloist for many important events like the Korean Musician Association of Southern California held at Colburn School’s Zipper Hall and was a special guest on the spotlight show on KLCS television network, and a soloist in the YMF Children’s Burn Foundation. She has performed at summer festivals like Music Academy of the West in Santa Barbara, and this summer Sarasota Chamber Music Festival, ENCORE, and Perlman Chamber Workshop in Shelter Island, NY. Sharon is an active chamber ensemble and orchestra musician on both the violin and viola. At age 13, sitting in the first violin section, she was the youngest member of the American Youth Symphony before being moved up to Assistant Concertmaster of the symphony in the 2003-2004 concert series. She was a member of the Colburn Chamber Orchestra as a violinist and violist from 1998-2000 and served as the Principle Violist in the Crossroads Chamber Orchestra who performed at the Walt Disney Concert Hall under the baton of Maestro Esa Pekka Salonen during the 2003-2004 concert series. Sharon was invited to play at the Ravinia in Chicago, the Lincoln Center in New York, and the Hollywood Bowl as a member of the Disney’s Young Musician’s Symphony Orchestra, all which aired nationally on the Disney Channel. Sharon performed the Dvorak Terzetto with world famous violinist Midori at a chamber music concert as part of the Los Angeles Philharmonic Chamber Music Series and also worked with renowned artists and pedagogues Zakhar Bron, Aaron Rosand, Victor Danchenko, Rugierro Ricci, Almita Vamos, Ani Kavafian, Pamela Frank, Alexander Treger, and Martin Chalifour. Sharon is a multiple recipient of the Young Musician’s Foundation Scholarship, the Leni Febland Scholarship, and was a full scholarship student at the Colburn School of Performing Arts where she was a student of Robert Lipsett. Currently, Sharon attends the New England Conservatory in Boston where she studies with Donald Weilerstein. Sharon Park performs on a rare 1745 Januarius Gagliano, graciously on loan from the Mandell Collection of Southern California.